New Delhi, Feb 9 (IANS): Expectations of citizens today are disproportionate to what they contribute to the government coffers, as it collects just as much tax to GDP as the government used to in the time of Chandragupta Maurya, more than 2000 years back, Niti Aayog member Bibek Debroy said here on Friday. The economist said this during his address at the Delhi University on the topic, 'The notion of governance in Mahabharata, Ramayana, and Purana'. Citing Kautilya, otherwise known as Chanakya, he said the tax collected to total GDP, as calculated by the famous economist then, was 17 per cent, which is equal to what the Indian government gets even now. "Now consider our demands. We want 10 per cent to go to infrastructure, six per cent for education, four per cent to go towards health... whenever we expect government to do anything implicitly there's a prioritisation of resources, we need to do this, we need to do that. "And in terms of prioritisation... most of us will agree on defence and security of the nation, speedy dispute resolution, and correctional law. This is exactly what Rajan (the virtutous king) did then," he said. Debroy was invited by the Delhi University for its third distinguished alumni lecture. He studied at the Delhi School of Economics of the varsity. 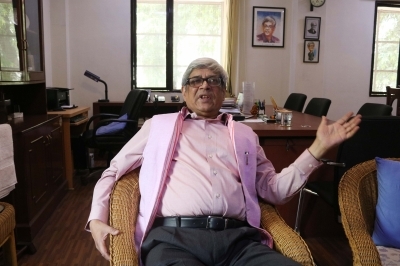 Debroy, who is Chairman of the Economic Advisory Council to the Prime Minister, also said that citizens since centuries "have abdicated their responsibility". "Today if the government demands something from the people, there will be howls of protest... Don't expect government will take care of everything. All of us need to take responsibility, which is part of the Constitution also," he said. Eminent scholar of art and dance Kapila Vatsyayan and Supreme Court judge Arjan Sikri have delivered the previous alumni lectures.